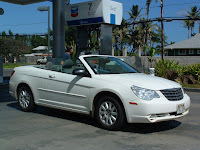 We put the top down, cranked up the Hawaiian tunes and headed out to explore O'ahu the other day. Enterprise Rent-a-Car made us another one of those incredible deals: $5 a day extra and we went from a cramped little econo model to wheels that make us decades younger when that top snaps into the trunk. 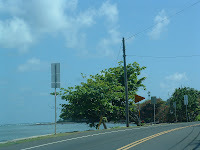 Wind in the hair, sun on the face and we headed out to Hale'iwa (hall-eh-E-va), on the island's North Shore. The town,once a popular res ort area in the early 1900's, is considered a Surfing Capital these days. 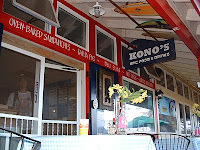 Had a Hawaiian breakfast - eggs, rice and Portuguese sausage - at a great little place, Kono's, and watched pickup truck loads of surfer boys and boards go past traveling from one beach to another. Then continued around the island past Turtle Bay Resort and its expansive golf course to Kahuku, the place known for its Shrimp Trucks that line the roadway, grilling up shrimp that is served on paper plates and eaten at picnic tables along gravel parking lots. Heard a woman the other day in the hot tub speculating on the 'cleanliness' of such places. . .that silly wahine. . .they serve some of the the most mouth-watering meals we've ever eaten on O'ahu. 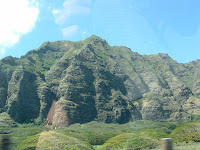 We drove for miles with the Wai'anae and Ko'olau moun tain ranges to one side and ocean shore to the other. Didn't make it all the way around the island; so caught H-3, the freeway with an incredibly long, long tunnel through the mountain range and headed back to Ko Olina. Total travel time less than four hours.